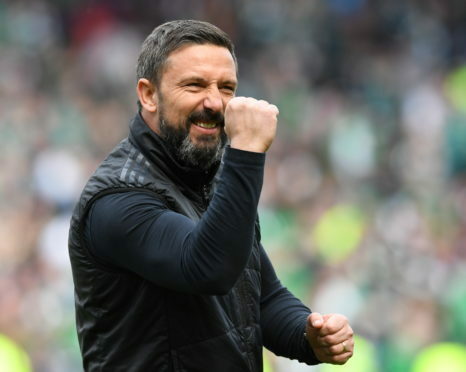 Derek McInnes' side started the season with a point against Rangers. Aberdeen youngster Bruce Anderson came off the bench to rescue a point against 10-man Rangers on his Dons debut. The Gers were reduced to 10 men after 12 minutes when Alfredo Morelos was sent off for kicking out at Scott McKenna. But the visitors were undeterred and took the lead with 30 minutes on the clock when James Tavernier stroked home from the penalty spot after Dominic Ball had fouled Josh Windass. The Dons created little, despite the extra man, and failed to register a single shot on target during a disjointed display until 19-year-old Anderson popped up with an injury-time equaliser to earn the Dons a share of the spoils. Aberdeen made two alterations from the side that started against Burnley with Dominic Ball and Stephen Gleeson drafted in for the suspended Shay Logan and the injured Tommie Hoban. Rangers, who were also in Europa League action on Thursday against Croatian side Osijek, made three changes with Josh Windass, Scott Arfield and Jamie Murphy in for Ryan Kent, Daniel Candeias and Ovie Ejaria. The game kicked off following a minute’s applause for Gothenburg Great Neale Cooper, who played for both clubs, and it was the visitors who threatened first. The Dons defence was caught out with a long ball over the top but Joe Lewis was quick off his line to deny Murphy. The hosts were struggling to gain a foothold but they received a major boost in the 12th minute when Morelos was sent off for kicking out at Scott McKenna off the ball. Despite their numerical disadvantage, Rangers took the lead with half an hour gone when Ball was penalised for a foul on Windass and Tavernier slotted home from the penalty spot. To make matters worse for the Dons, Scott McKenna suffered a hamstring injury in the build-up to the penalty and was replaced by Chris Forrester. Sam Cosgrove was starved of service for long periods as the home side failed to make the extra man count. Rangers continued to look the more likely after the break with Lassana Coulibaly finding Windass with a deep delivery but the midfielder nodded over. McInnes tinkered with his formation, reverting to a three-man defence and throwing on Stevie May for the ineffective Gleeson. The Dons slowly began to create opportunities with Devlin nodding over from a Mackay-Steven corner before Lewis Ferguson failed to find the target from a Devlin knockdown as time ran out for the hosts. But, two minutes into injury time, the ball fell to Anderson in the area and he arrowed a shot low beyond Allan McGregor to give the Dons a point.